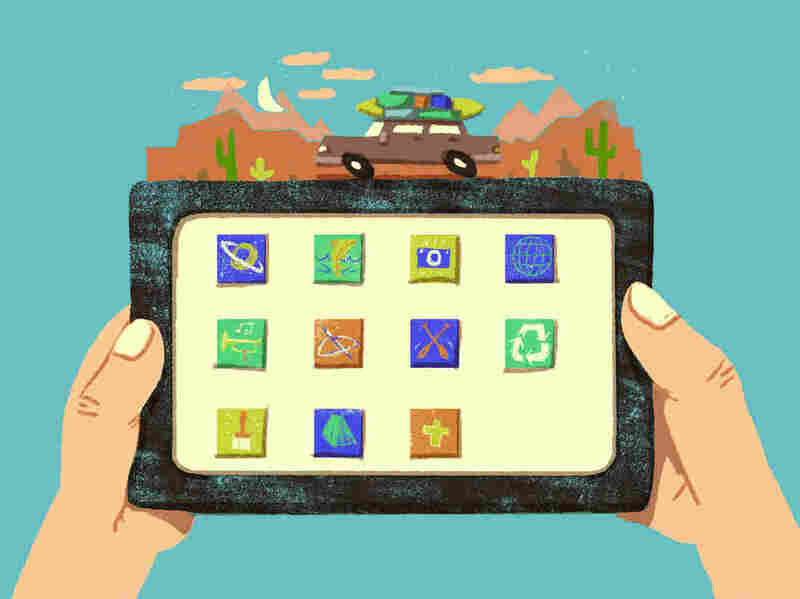 Parents: Here's How To Pick The Best Kids Apps For Family Vacations : NPR Ed A handy guide to choosing fun and educational media for kids this summer. An earlier version of this piece ran in June 2017. It's summer vacation season again and many families will be lucky enough to be heading off for at least a few days. At least half of parents say quality time together is the most important reason to take a family vacation, according to a national survey by the rental car company Alamo. These recommendations come with an important caveat. The American Academy of Pediatrics' latest guidelines on screen time for kids emphasize the need for balance with other activities. The goal for school-age children is at least 60 minutes of physical activity a day. Meals and other designated family activities should be screen-free time. For the youngest kids, ages 2-5, Elgersma recommends an app called Busy Shapes. "It's puzzle-based and gets increasingly more challenging as kids play," says Elgersma. Many of the most worthy apps for kids are better described as "a toy as opposed to a game," in the words of Bjorn Jeffery, the former CEO and co-founder of Toca Boca. Toca Boca, one of the most award-winning app companies, is recommended highly by Elgersma. Their first app was Toca Tea Party, basically a play-pretend game, with no points or levels. "It's more similar to Lego," says Jeffery. "You can't win at Lego, it just is what it is." In user testing of the tea party game, one surprising, and fun, change that preschoolers asked for was more spilling. In this category, Elgersma also recommends My Playhome, which is like a digital dollhouse, and Me, by TinyBop, which is a personal scrapbook kids can fill in by answering questions and putting in videos and pictures. Don't underestimate the power of a good story. Electronic devices are good for reading and listening, not just watching. Amazon's FreeTime Unlimited is one major subscription service. Epic! is another. Both include thousands of picture books, chapter books, graphic novels, and even cookbooks grouped by ages. Epic! features a nifty weekly progress email for grownups and some light "game" features that encourage kids to keep reading. For pre-readers there are backseat options too. A recent brain study showed kids getting a lot out of narrated slideshows (which are available on Epic!, FreeTime Unlimited, YouTube and elsewhere), essentially the automated version of reading a book. Audiobooks and podcasts are other possibilities that can be fun for the whole family. Finally, Amazon's FreeTime app has a "Learn First" feature that allows parents to mandate a certain amount of reading before switching to other screen-based pursuits. Going camping? Toca Nature is aimed at kids older than age 4. Explore different habitats and get a gentle introduction to the food chain. Going to the beach? A city? Tinybop has an "Explorer's Library" series that includes Coral Reef and Skyscraper. Some kids' apps are free to play initially, but dangle all kinds of extra goodies that cost money. In 2017, Amazon was forced to refund over $70 million in in-app purchases made by children without their parent's knowledge. Apple and Google have had to do the same in years past.